Trumpler (1930) demonstrated the existence of interstellar absorption by comparing luminosity distances and angular diameter distances of a sample of open clusters. he attributed it to Rayleigh scattering due to tiny grains (size about 25 ). A more appropriate term would be smoke: indeed, the particle sizes are much smaller than in terrestrial dust. 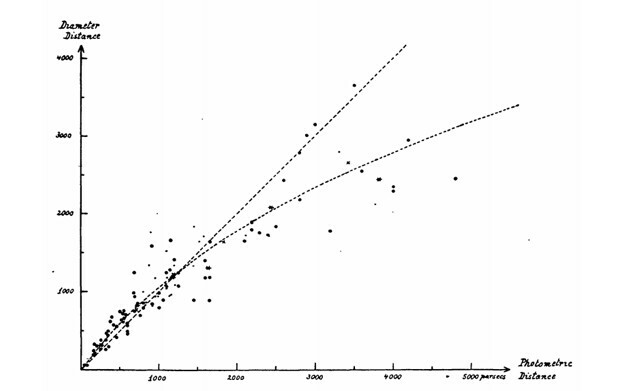 Trumpler's comparison of the luminosity and diameters distances for 100 open clusters. Credit: Trumpler (1930). Extinction depends strongly on the direction (up to 30 mag towards Galactic center). Dust extinction. Extinction is due to dust grains that have diameters about the wavelength of the light. Gas extinction by scattering, but its scattering efﬁciency per unit mass is much smaller. by scattering, the direction of light propagation is changed. Geometrical cross section of spherical particle : . where is the “extinction efﬁciency” factor. Volume element with length and cross section ; particle density . Number of particles in the volume element: . where : mean particle density along the line of sight to the source at distance . Evidence of interstellar dust comes from interaction with starlight and from emission of light. Extinction of background stellar light (“holes in the heavens”). 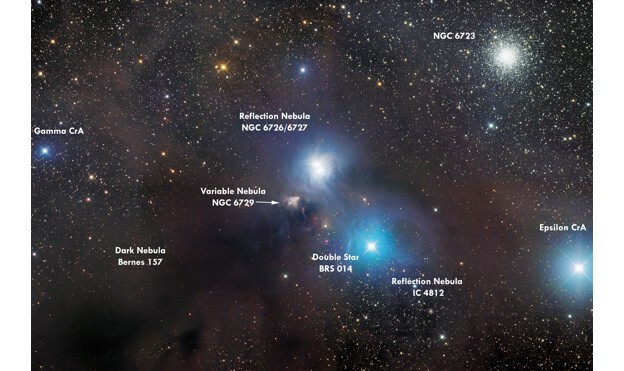 Reflection of light from nearby stars (producing reflection nebulae). Polarization of light (by scattering or by interaction with aligned dust grains). Dust clouds can be revealed by means of light emitted by dust grains. Thermal continuum emission from grains at radiative equilibrium (MIR and FIR radiation). Thermal continuum emission from non-equilibrium heating (NIR and MIR radiation). Infrared emission bands from heated dust grains. A complex ISM system with blue reflection nebulae (NGC 6726/6727 & IC 4812) and a dark nebula. Credit: Martin Pugh. 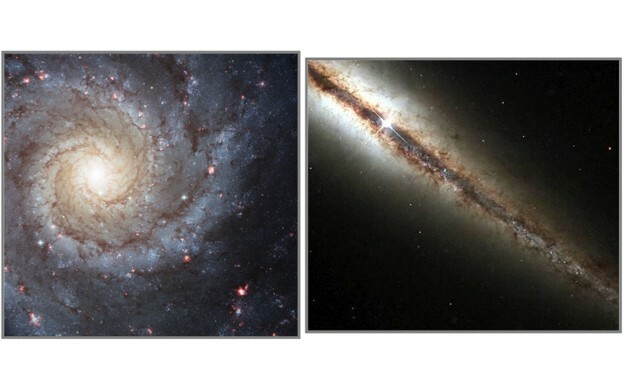 A face-on spiral (M74) and an edge-on spiral (NGC 4013). Credit: NASA/Hubble Space Telescope. Abundance of in the ISM and catalysis on dust grains. 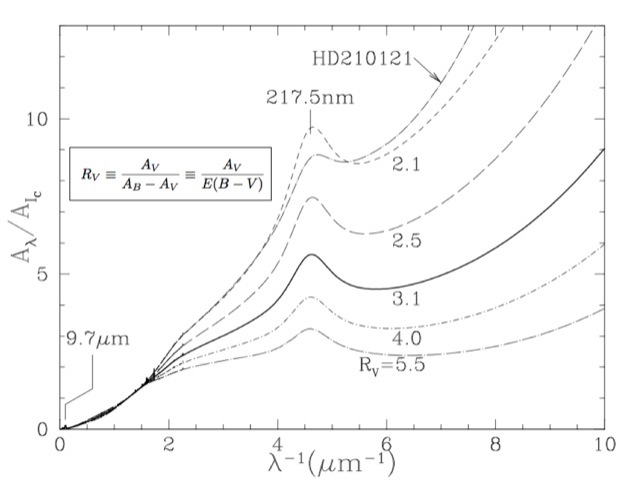 The temperature of interstellar diffuse HI and : effect of heating by photoelectrons ejected from interstellar grains. Extinction relative to the extinction at I = 900 nm on a typical sightline in the local ISM. Extinction curves for our Galaxy compared with the Magellanic Clouds. 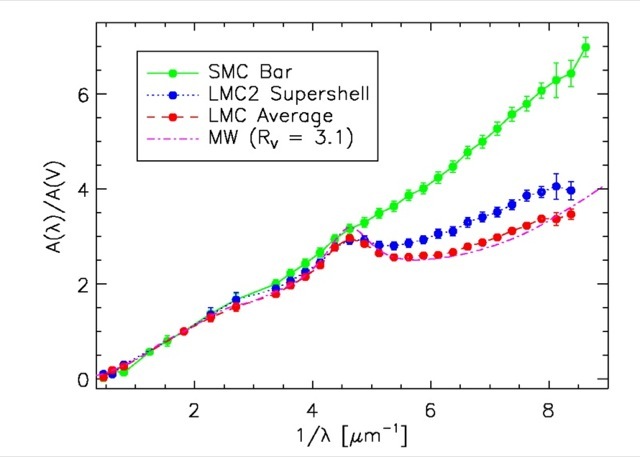 LMC: 2175 Å bump and stronger far-UV extinction in the region associated with the LMC2 supershell. SMC: no 2175 Å and very strong far-UV extinction in the star forming Bar. 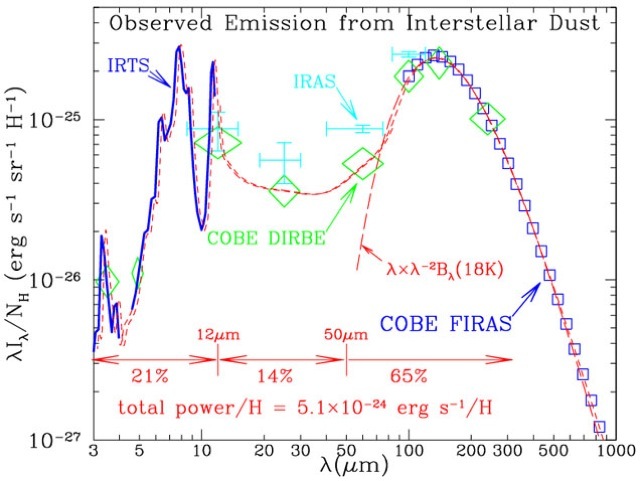 In starburst galaxies, the dust lacks the 2175 Å bump. Average extinction curves for MW, LMC, and SMC, based on Gordon et al. (2003). Credit: Wikipedia Commons. Emission spectrum of diffuse interstellar dust in the Milky Way. Credit: Draine (2003). 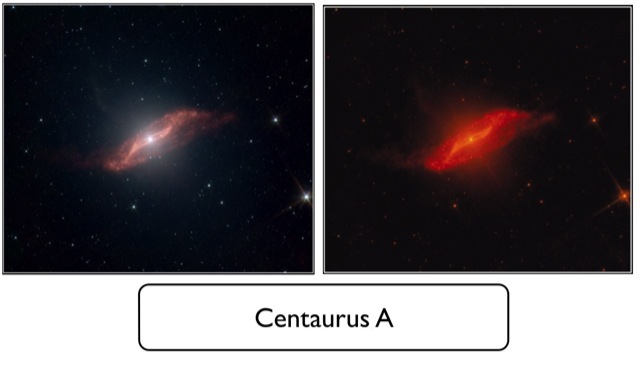 Mid-infrared images of the galaxy NGC 5128 with Spitzer Telescope with two filters sets. Credit: NASA/Spitzer Telescope.